In this sewalong we’ll be demonstrating how to sew a jacket with both our original unlined Kelly Anorak sewing pattern and how to sew a lined version using our Kelly Lining pattern expansion. The construction for both jackets is very similar, but there are a few things that differ if you are sewing the lined version. A quick note about the navy lined version you’ll see demonstrated- we used a specialty DWR (durable water repellant) fabric called Ultrex. If you’re interested in sewing a waterproof anorak too, we have also shared a few tips we learned along the way about how to sew with this kind of fabric in our post about sewing with waterproof fabrics and seam tape. 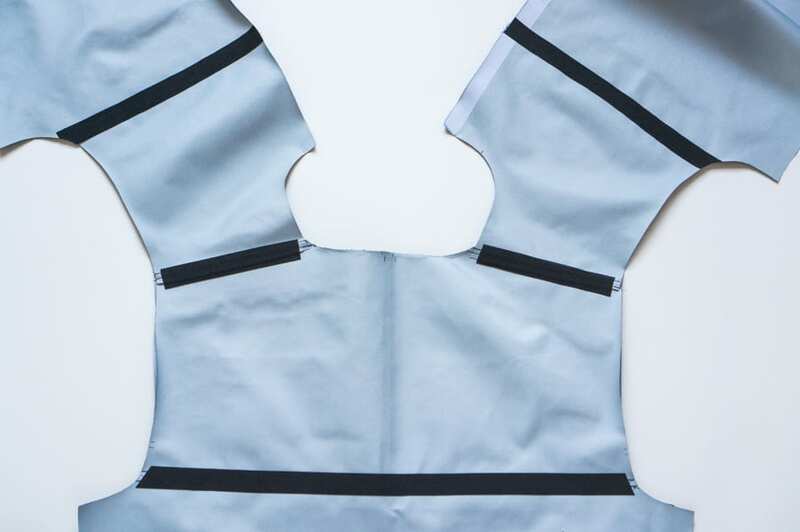 Our Kelly Anorak sewalong will dive right in without explaining the cutting and interfacing stage, since the required pieces will vary depending on if you are sewing the unlined or lined version, and if you decide to add a hood or collar. 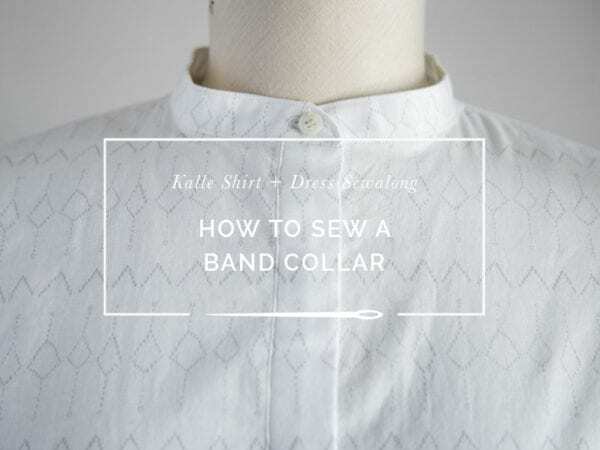 If you follow the fabric cutting diagrams and interfacing guide from the latest updated pattern instructions, you will have all your pieces ready to go and you can start sewing. 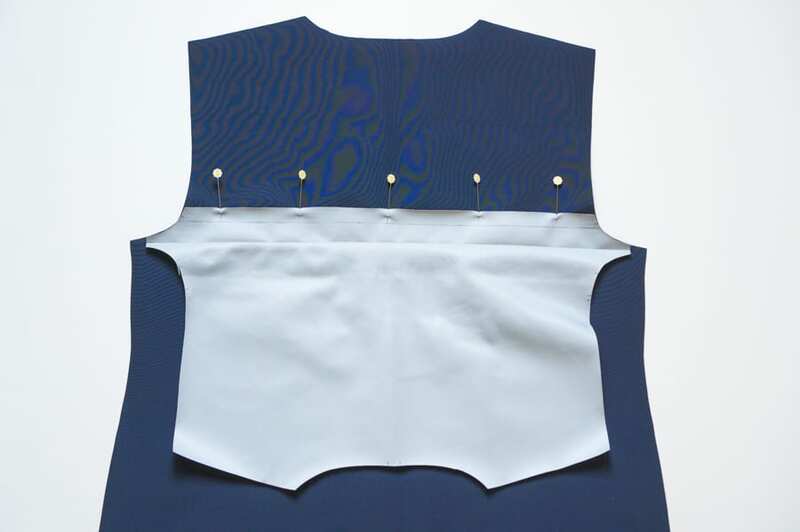 The most important thing to pay attention to in the cutting stage is the positioning of the pattern pieces for the zipper plackets and facings, as well as making sure you mirror your pattern pieces when necessary. 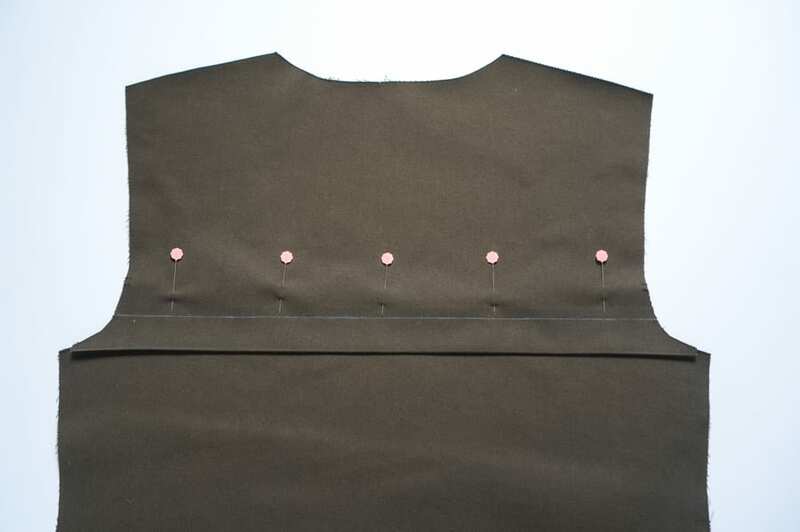 Don’t forget to transfer all important markings such as pocket and grommet/buttonhole placement from your pattern to the wrong side of your fabric using a removable marking tool! Onwards! Let’s start by assembling the back of the Kelly Anorak. 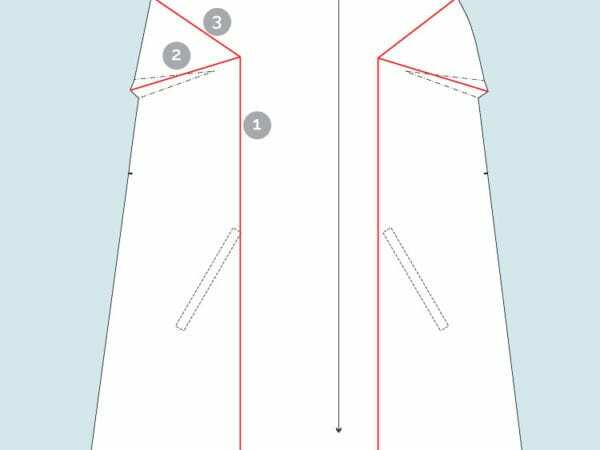 These steps are the same whether you sew the unlined or lined version of the jacket. 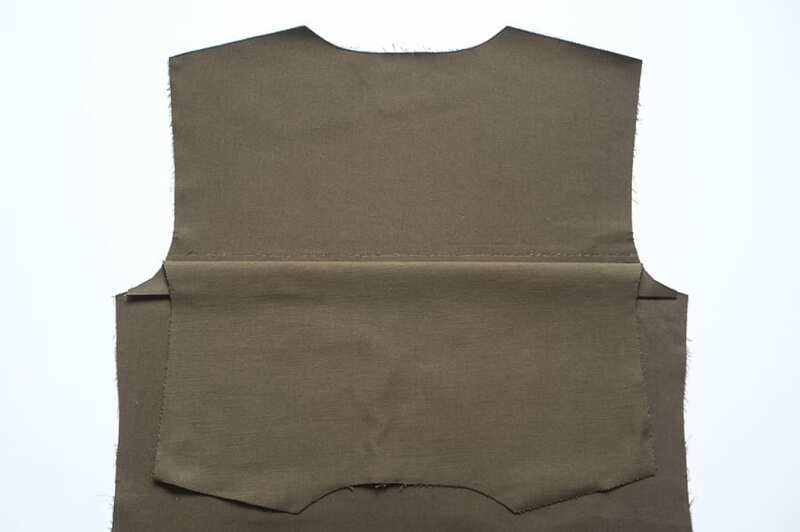 With wrong sides together, fold the bottom edge of the back yoke up, matching the single notches, and press. You can use a seam gauge to make sure the fold is even. 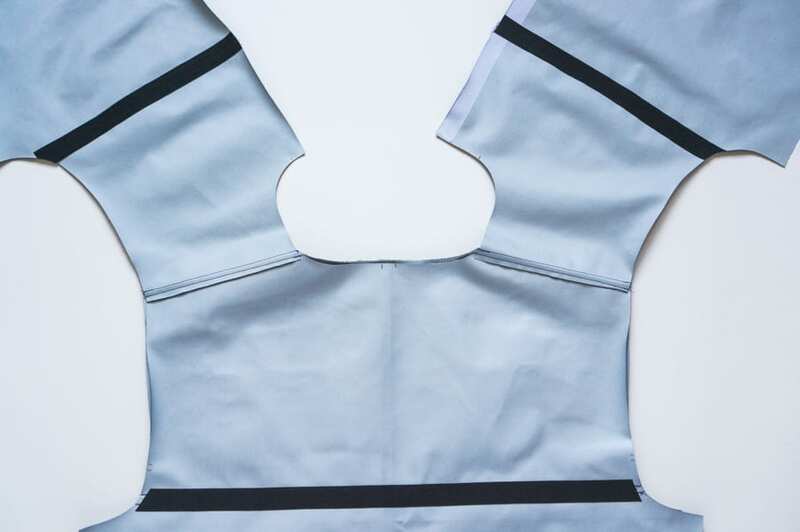 Open the fold you pressed, and with right sides together, lay the back yoke on the back jacket piece, matching the single notches. 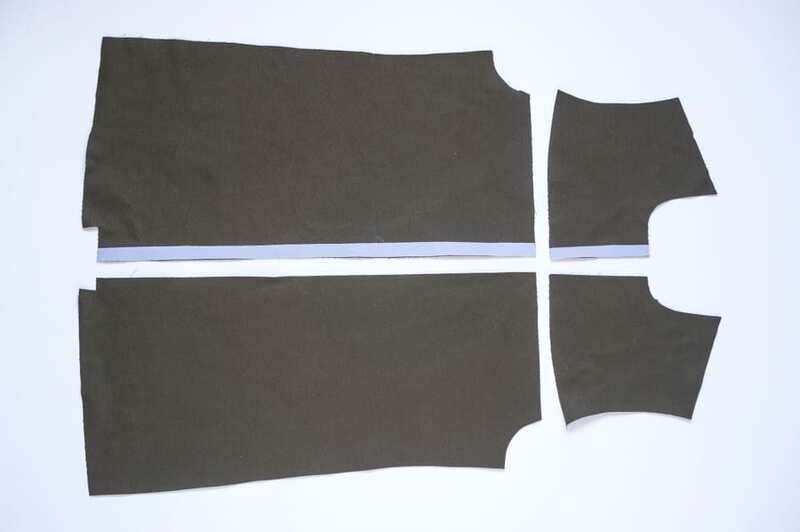 Sew the yoke to the back with a 5/8″ seam allowance. It’s helpful to draw your stitch line in with a marking tool to ensure you’re sewing in a straight line! If you are sewing with waterproof fabric, it’s ok to pin here as the yoke will be folded up over this seam allowance, covering your pin holes. 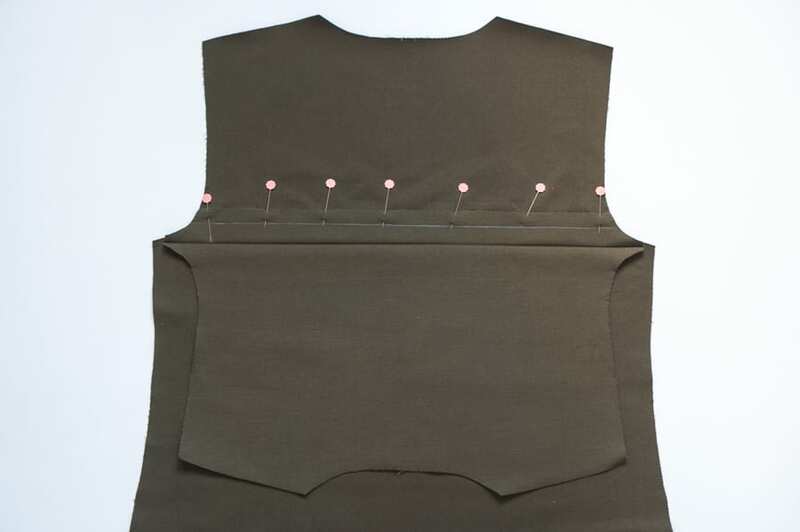 Fold the yoke up along the fold line you pressed earlier and line the yoke up with the back jacket piece along the neckline, shoulders and armscyes. Draw another stitch line with your removable marking tool along the back yoke between the single notches and topstitch along this line. A pleat will be formed on the bottom edge of the yoke. For our unlined cotton twill Kelly Anorak, we used the triple stitch option on our sewing machine whenever possible for our topstitching for added strength and visibility. 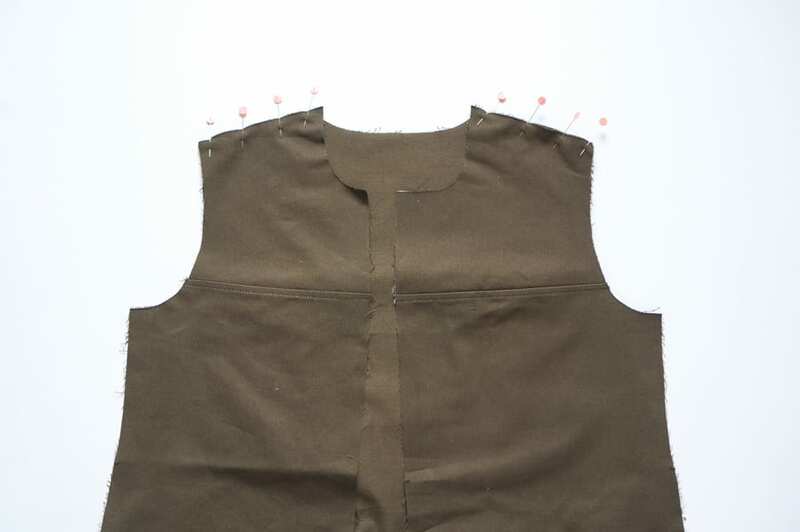 If you like, you may baste the pleat of the yoke to the back of the jacket along the armscye, so it is treated as one piece of fabric later when you sew in the sleeves. 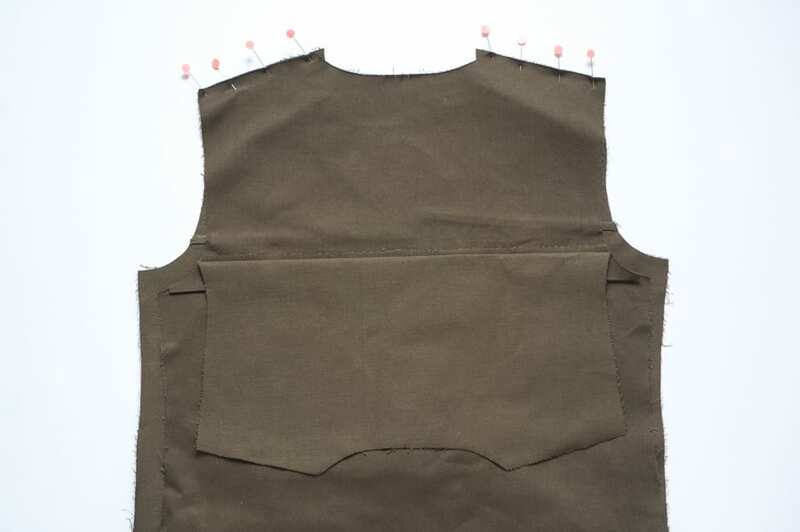 With right sides together, pin the front yoke to the front jacket and sew at 5/8″ seam allowance. It’s normal if the edge near the armscye does not line up. When you are pinning pieces like these together, you are matching them along the seam allowance, not along the raw edges. 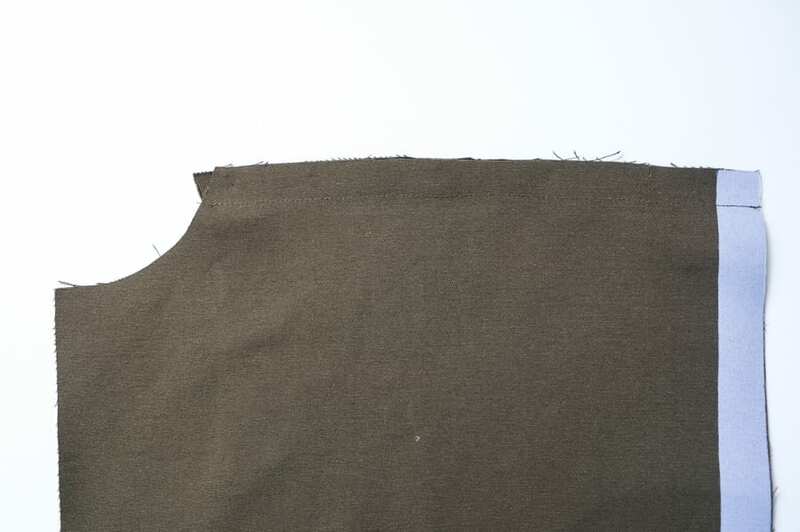 Press the seam down towards jacket hem and finish with either a flat fell seam or a faux flat fell seam. We have a full tutorial on sewing flat fell seams here if you’d like more guidance. At this point, it’s recommended to assemble and attach your pockets to the jacket front before attaching the jacket front to the jacket back. 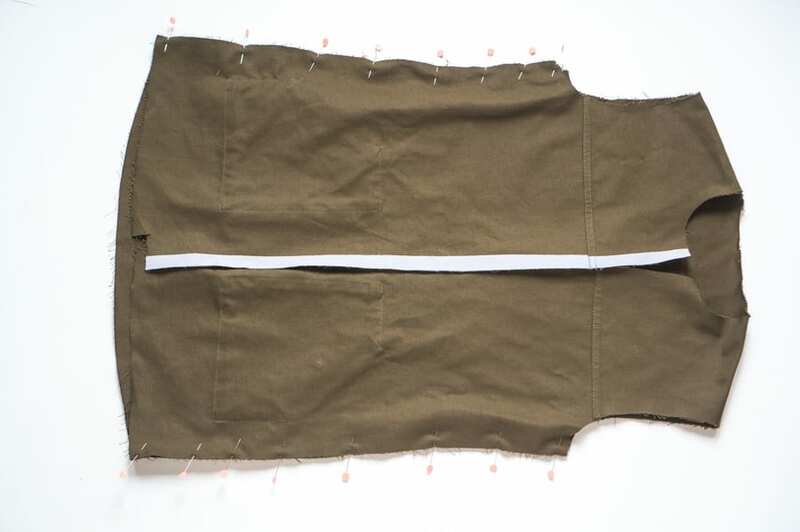 You’ll find it’s easier to do this step now before sewing the front and back together using the following “burrito method” since you’ll have less fabric to manipulate under your machine. 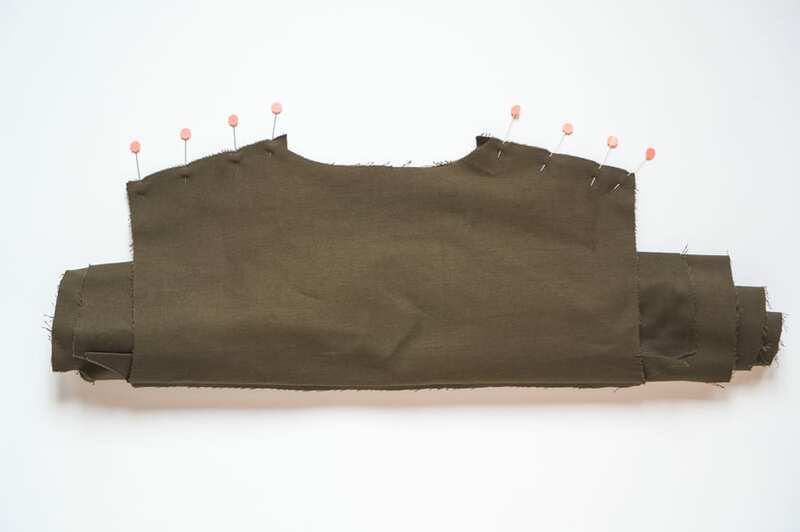 Skip ahead to our gusseted pocket tutorial to attach your pockets! 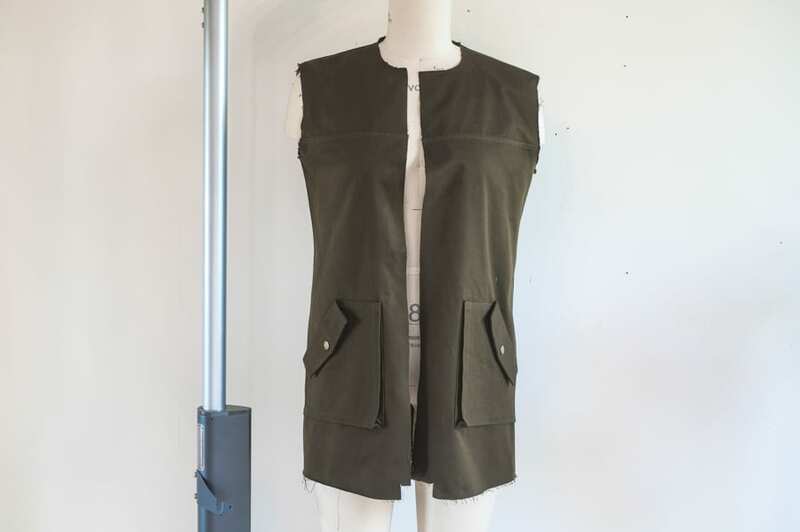 Once your pockets have been attached, you’ll be ready to finish assembling the jacket body. 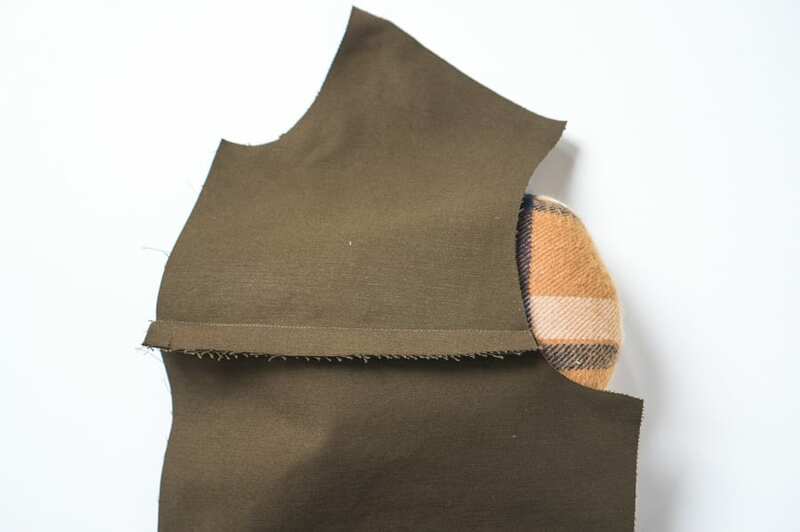 Take the back jacket piece and fold the back yoke down and away from the shoulder seams. 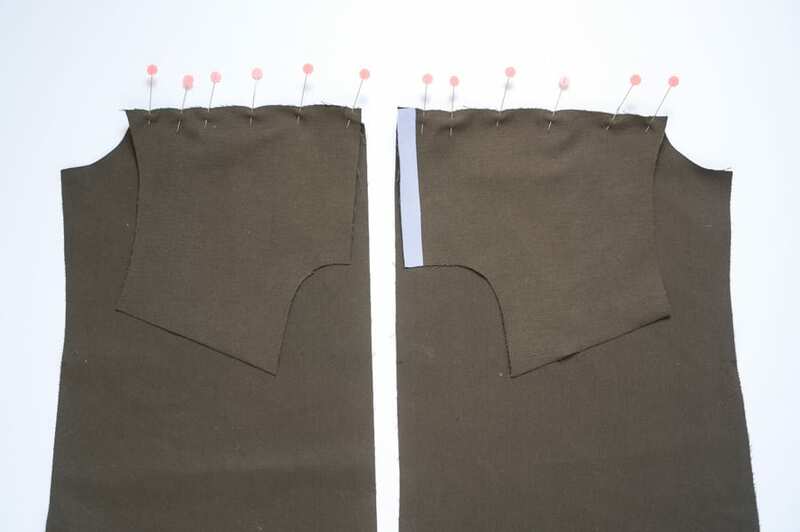 With wrong sides together, line up the left and right front jacket pieces with the jacket back along the shoulder seams. Pin in place and baste together just inside the 5/8″ seam allowance. Here, you see the back of the jacket facing right side up with the back yoke folded down so the wrong side is facing up. The front jacket pieces underneath the back of the jacket are right side down on the table, with wrong sides up. Flip your project so the front of the coat is facing you. 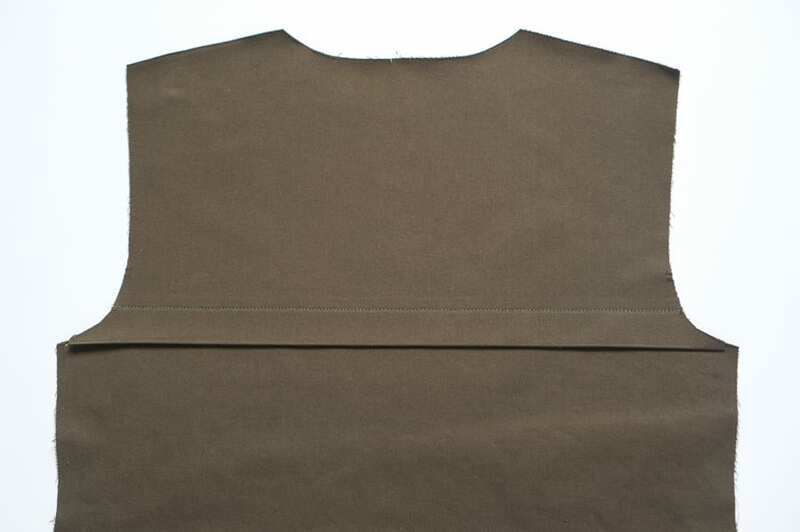 Starting from the hem, tightly roll the front and back jacket pieces together up towards the shoulder seams. The unfolded back yoke will be hanging down, with right side up. Fold the back yoke up over the rolled-up front and back jacket pieces and match at the shoulder seams. Pin in place and stitch at 5/8″ seam allowance through all three layers. Grade your seam. It’s time for the best part! Gently pull the rolled-up front and back jacket pieces through the neckline of the jacket. 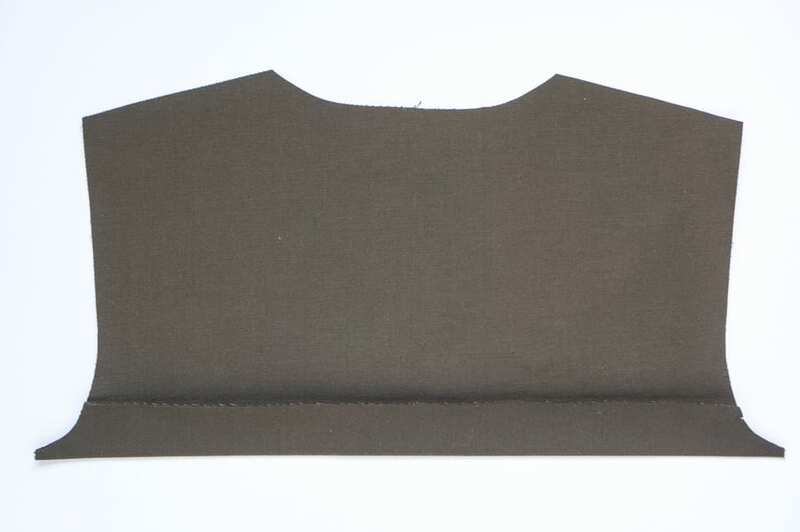 Press well and topstitch along the shoulder seams. 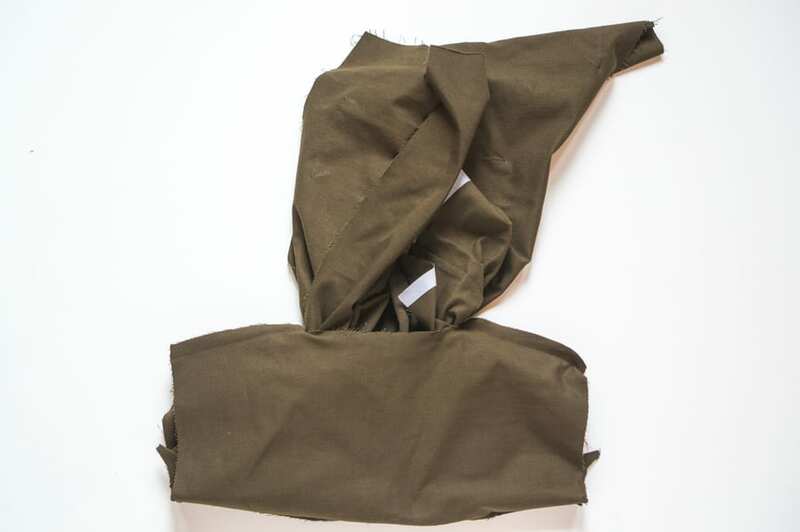 We did not use the burrito method for assembling the jacket body for our navy waterproof Kelly Anorak sample. Because this fabric is very thick and stiff, it would be tricky to pull the roll through the neckline of the jacket. This version is also going to be fully lined, so it matters less if the shoulder seams are cleanly encased between the jacket back and the back yoke. In this case, we simply sewed the left and right front jacket pieces to the back of the jacket and back yoke with right sides together. We trimmed the seam allowance and pressed them towards the back, topstitched, and finished the seam with our iron-on seam tape. 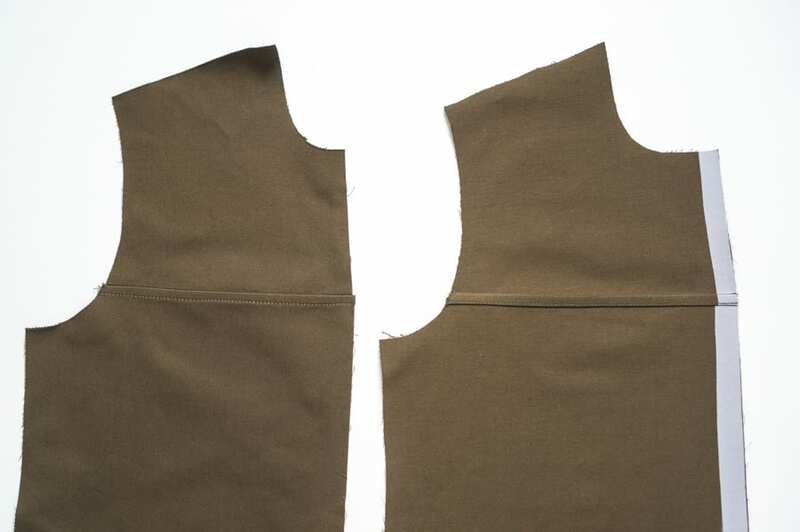 With right sides together, match up the side seams of the front and back jacket pieces. 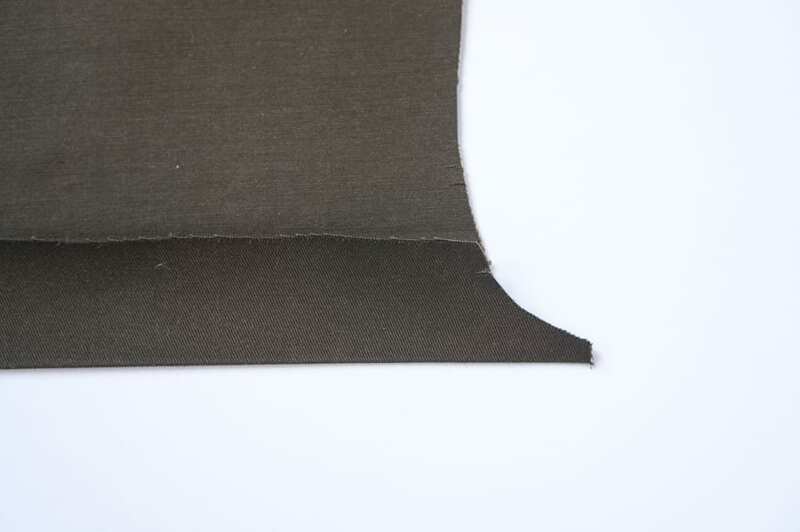 Sew at 5/8″, press the seam to the back, and finish with either a flat fell seam or faux flat fell seam. For our waterproof lined version, we trimmed the seam, pressed it to the back, topstitched at 1/4″, and finished with seam tape. By now your jacket is starting to take shape. The next step is to attach the drawstring. Read the next post in our Kelly Sewalong series. Get the pattern here.